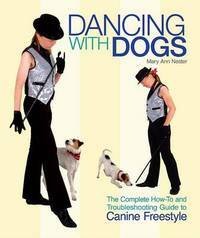 Dancing With Dogs is a complete guide to getting you and your dog moving in the exciting sports of Canine Musical Freestyle (also known as Canine Freestyle or Musical Freestyle) and Heelwork to Music. Written by an expert trainer and instructor, the book presents information on the basics of getting started and skill buildingemphasizing those areas of the sport that competitors most want clarifiedto help lay the foundation for more advanced dancing moves. It also teaches you how to create an innovative and exciting performance from start to finish. Troubleshooting tips are presented in an easy-to-follow question-and-answer format to address common problems such as difficulty with heelwork and weaving. The advice offered is suitable for competitors at any level, from beginner to advanced. The dynamic, instructive color photos and illustrations highlight key information throughout the text.